With the D7200 digital camera, Nikon proves once again that you don’t have to give an arm and a leg — or strain your back and neck — to enjoy dSLR photography. The D7200 addition to the Nikon family of dSLRs doesn’t skimp on power or performance, offering a great set of features to take your photography to the next level. 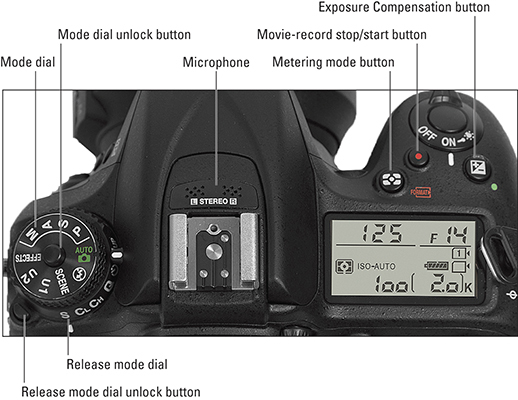 If you’re not familiar with the Nikon D7200, here’s a quick guide to its buttons, dials, and other external controls. 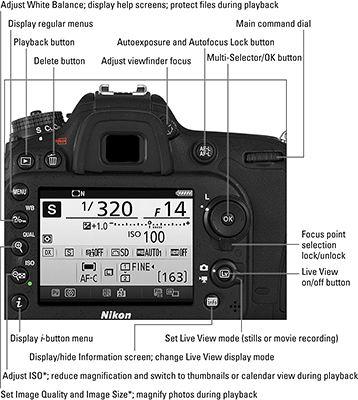 Note that some buttons serve multiple functions depending on whether you’re choosing options from menus, selecting shooting settings, or reviewing photos in playback mode. Also, functions marked with an asterisk don’t work in Live View mode. Rear view of the Nikon D7200. Top view of the Nikon D7200. 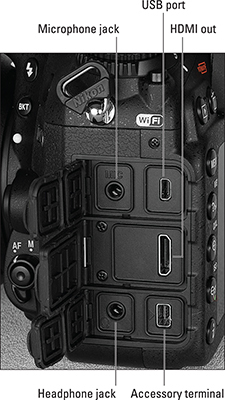 Close-up view of a couple of the Nikon D7200’s buttons and dials. Side view of the Nikon D7200. The hidden panel of your Nikon D7200. Before every shoot, review these critical picture-taking settings on your Nikon D7200. Note that this information relates to viewfinder photography. Most options work the same way during Live View photography, but autofocusing options are very different. For more creative control, use A exposure mode on your Nikon D7200 to photograph still subjects and S mode to capture moving subjects. The following recipes show you how. 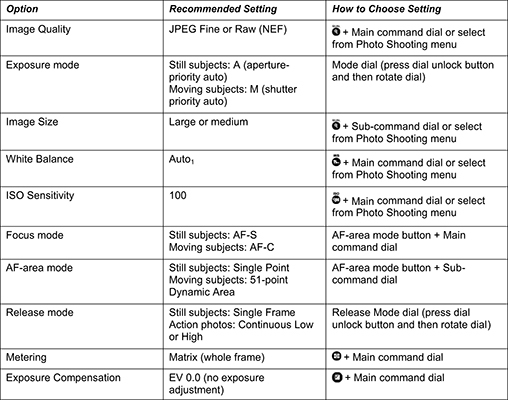 Set the Mode dial to A (aperture-priority autoexposure). In this mode, you control f-stop, which affects depth of field, enabling you to blur the background in portraits or snap a landscape photo that’s sharply focused throughout the whole scene. The camera selects the shutter speed needed to produce a good exposure at the current ISO setting. Rotate the Sub-command dial to set the desired f-stop. Choose a high number for a larger depth of field (focus remains sharp over a greater distance), or a low number to blur the background. Set the Release mode to S (single frame). You get one picture for each press of the shutter button at this setting. To add flash, press the Flash button to raise the built-in flash. Set the flash mode by pressing the Flash button while rotating the Main command dial; use Fill flash for normal flash behavior. 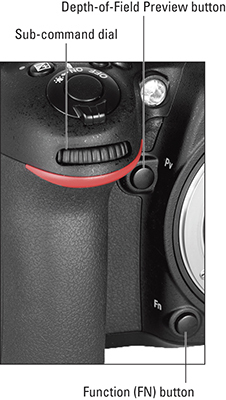 Adjust flash power by pressing the button while rotating the Sub-command dial. To disable flash, close the flash unit. Set the lens and camera to autofocus mode. On the camera, set the Focus-mode selector switch to AF. On your lens, the setting is usually marked A or AF. Set the Focus mode to AF-S and set the AF-area mode to Single Point. To adjust the Focus mode, press the AF-area mode button while rotating the Main command dial. Press the button while rotating the Sub-command dial to change the AF-area mode. Use the Multi Selector to choose a focus point. You may need to press the shutter button halfway and release it to wake up the camera before you can choose a focus point. Also make sure that the Focus Selector Lock switch on the back of the camera is set to the white-dot position and not to L.
Focus is locked as long as you hold the shutter button halfway down. Exposure metering begins but is adjusted until you take the shot. Press the shutter button down the rest of the way to take the shot. If the picture is under- or overexposed, try using Exposure Compensation on the next shot. Press the Exposure Compensation button (on the top of the camera) while rotating the Main command dial to set the adjustment value. Raise the value for a brighter exposure; lower it for a darker image. Set the exposure mode to S (shutter-priority autoexposure). In this mode, you control shutter speed, and the aperture selects the appropriate f-stop to expose the photo at your current ISO setting. Using flash limits you to a slow shutter speed (1/250 second) and prevents you from shooting a continuous burst of frames. For the built-in flash, just close the flash unit to disable it. Rotate the Main command dial to set the shutter speed. Choose a higher number to freeze action; use a slow speed to blur motion. Set the Release mode to Continuous Low (CL) or Continuous High (CH). Continuous Low records up to three frames per second by default (more than enough for most subjects). Continuous High can shoot as many as six frames per second. Set the Focus mode to AF-C; set the AF-area mode to 51-point Dynamic Area. Select a focus point (using the Multi Selector) and compose the scene with the subject under the selected focus point. Focus is set based on your selected focus point but is adjusted if the subject moves away from that point. Exposure metering begins and is also adjusted up to the time you take the shot. Press and hold the shutter button all the way down to begin recording frames. As long as you hold the button down, the camera captures a continuous burst of shots. Release the shutter button to stop shooting.